The mission of those serving Jamestown Charter Township as members of the Ottawa County Sheriff’s Office is to work in conjunction with township officials to enforce the laws and ordinances of our state, county, and township, support the constitution of the State of Michigan, and protect the lives, rights, and property of all residents and guests in a professional and courteous manner. Law enforcement services are provided to the residents of Jamestown Township by the Ottawa County Sheriff's Office. Jamestown Charter Township decided to enhance their local policing efforts by creating a community policing position which is contracted through the Ottawa County Sheriff’s Office. Together with the Hudsonville Public Schools, Jamestown Charter Township’s contract provides an Ottawa County Sheriff's Deputy that is assigned specifically to Jamestown Charter Township and the Hudsonville Public Schools within the township. This has been a successful partnership since 1999. 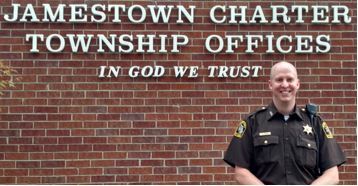 In addition to general patrol duties, including answering calls for service and enforcing traffic laws, the Deputy assigned to Jamestown Charter Township is focused on the community policing aspect of law enforcement. This includes being involved in and initiating community events, teaching and mentoring students in the area schools, and maintaining an active relationship with local churches, businesses, multi-housing units, and the residents of Jamestown Charter Township. Ottawa County Central Dispatch participates in the Smart911 program. Sign up for Smart911 and create your own Safety Profile to give 9-1-1 valuable information about yourself, family members, your home, pets and even vehicles that will automatically display on the 9-1-1 call taker's screen when you make an emergency call. It's private and secure and you control what information is in your profile. These details can save valuable seconds or even minutes during an emergency. Jamestown Charter Township, through its community police officer, provides free vacation security checks to its citizens who will be away from their homes, businesses, or other facilities for a period of time. Deputies will periodically check the exterior of the premises. This service is offered to deter potential burglars and provides additional security while your premise is unoccupied. Ottawa County Sheriff’s Office works alongside Ottawa County Central Dispatch to maintain an informative contact list for local businesses. This contact list is used in the event that business owners or managers should need to be contacted during non-business hours. Please provide your business contact information on the Ottawa County Central Dispatch web site and submit it so police and fire can contact you in the event of an emergency during non-business hours. Fireworks shall not be ignited, discharged, or used in Jamestown Charter Township with the exception of the day before, the day of, and the day after a national holiday. During those days fireworks shall not be ignited, discharged, or used between the hours of 1:00am-8:00am. To view Jamestown Township’s fireworks ordinance, please click here. A consumer fireworks application and permit can be obtained through the township for use of fireworks outside the permitted days and times. No person shall operate a truck in Jamestown Charter Township on any road other than a designated truck route. View the ordinance for designated truck routes. Silent Observer Tips can be made by telephone at (877) 88-SILENT (745368), through the web, or text by sending "OCMTIP," plus your message to 274637. If you would like to see more information on Silent Observer and how it works for your community, please click here.